669 Megabytes of fun! It contains everything from the C-Kermit and G-Kermit areas of our FTP site: sources, makefiles, scripts, binaries, tar and ZIP archives, text files, the C-Kermit 7.0 and C-Kermit 8.0 Update Notes, and even MS-DOS Kermit, all organized for easy access through your Web browser (but a Web browser is not required). Also included are close to 500 prebuilt binaries; about 400 for all the platforms where C-Kermit runs (UNIX, VMS, VOS, AOS/VS, Plan 9, Amiga, . . .) and another hundred for G-Kermit. C-Kermit 7.0 (or earlier) binaries are included for platforms for which we don't have C-Kermit 8.0 binaries, such as Apollo Aegis, Tandy 6000, 2.11 BSD, etc. In other words, binaries are included for every platform that we have binaries for: all the ones you see HERE and: HERE, except that some of the duplicates have been omitted (e.g. CC and GCC builds for exactly the same platform), due to lack of space. 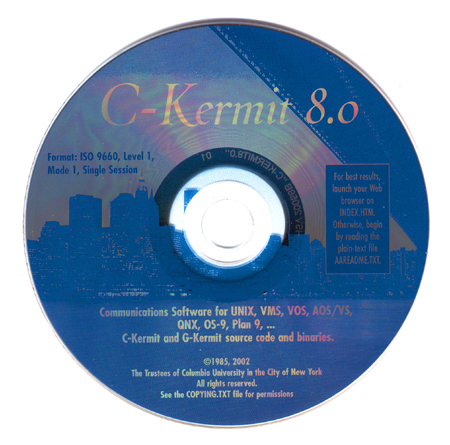 The C-Kermit 8.0 CDROM contains C-Kermit version 8.0.206 (October 2002). It is in strict ISO 9660 format, no extensions, and should be readable on any computer that can read CDROMs. It is included in the Kermit 95 2.1 shrinkwrapped package.